President Trump will give his State of the Union Address at 8 p.m. CT on Feb. 5. 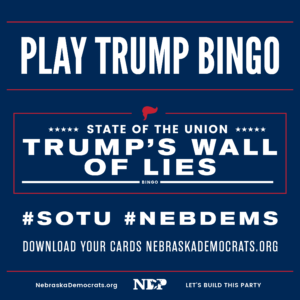 Download your Trump Bingo Cards here and play at home while you watch! Watch the State of the Union Address live followed by the Democratic rebuttal by former Georgia gubernatorial candidate Stacey Abrams. The NDP will be live Tweeting throughout the speech @NebraskaDems as will NDP Chair Jane Kleeb janekleeb.